Today we’d like to introduce you to Harlyene Goss. Harlyene, please share your story with us. How did you get to where you are today? Life is funny. You may have your life mapped out but if you are open, you can really be surprised. In my case, my education and career has been in medical technology doing hospital laboratory work, very left brained. It has financially supported me very well and I never have needed to worry about a job. However, something always seemed missing. I tried all kinds of side jobs even owning a small business. It wasn’t until I moved to Massachusetts 21 years ago and someone showed me a laminated obituary that something in my right brain clicked. I remember thinking I could do that better and that was the beginning of my creativity. Commemorative Bookmarks was born. Since I had just been through an unexpected divorce and an illness that caused me to leave the lab, there was absolutely no money to advertise the bookmarks. A very basic website was done via bartering. One day I realized that newspapers could use the bookmarks as an up-sell so that became my focus. Before the shift of the newspaper industry, I had 52 newspapers across the country selling Commemorative Bookmarks. In the last year I have rebranded the bookmarks Celebrating Life Bookmarks helping people create the bookmark they want to honor their loved ones as well as special events in their lives. Once my creativity opened, I had all kinds of ideas. Once the bookmarks were going well, my being an avid recycler and believing that reuse is the best recycling I developed a line of preprinted, laminated checklists called Easy Minder Reusable Lists. The ideas for the household, child care and pet care came from listening to my coworkers conversations at work. The Mini Grocery Kit has been selling in New England grocery stores for over 15 years. Using my medical background, the medication management lists I developed ended up helping my mother when she had a quadruple bypass. She came out of the hospital on 8 meds in 14 time slots. She attributes about a third of her recovery to the med chart helping her take her medications properly and on time. Her surgery led to my next product line. Two months after she came out of the hospital, my father calls me in a panic. He was afraid if he called 911 and forgot to tell the EMTs something, it could hurt my mother. This is how the Emergency Medical Info Kits were created. Using my background and contacts, I was able to have the EMI Kits vetted by emergency room staff and EMS coordinators. Since then, the EMI Kits have been personalized and sold to the home care industry, Fire departments and councils on Aging and Health departments across the country. As I look back to write the, I realize some of the challenges that presented themselves were about growth and trust. Money had always been a problem. Being creative, I found ways around but never was able to do things on the level I wanted. Not having any business training had me doubting and backtracking on many decisions. I had to learn to trust myself and my vision. However, my thought process presented the hardest and largest challenge. Having always had a job for security, it divided my time, attention and energy. There is also a difference in mentality of working for someone else and working for yourself that I had to unlearn. Some of these challenges still persist but since I started meditating regularly, I have learned to move past them. So, as you know, we’re impressed with HD Merrimack – tell our readers more, for example what you’re most proud of as a company and what sets you apart from others. 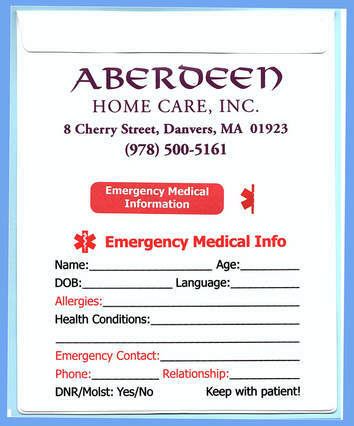 Through HD Merrimack, I have been able to create two very different product lines, Celebrating Life Bookmarks and Emergency Medical Info Kits. What I am most grateful and proud of is that everything I have created helps people remove stress from their lives. Whether it is helping to ease the grief someone feels losing a loved one to people being prepared for a medical emergency (one of the most stressful situations for patient and family), everything makes a difference for the better. With Celebrating Life Bookmarks, people get to create a bookmark that honors a special person or event in their life. They get to choose from a wide range of borders, symbols and poems. The memorial bookmarks bring solace and healing energy while our celebration bookmarks bring joy and remembrance to those special occasions. 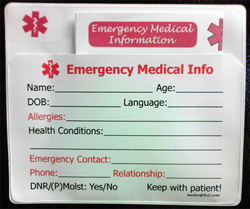 Emergency Medical Info Kits provide critical medical information in one place which helps EMS provide more accurate and safer treatment on the spot. HD Merrimack has been personalizing the EMI Kits to fire departments, Boards of Health, Councils on Aging and the home care industry. Home care agencies use the EMI Kits as part of their intake evaluation to provide added value and care. Feedback has shown that the EMI Kits make a difference to EMS and to the patients. The EMI Kits SAVES lives. One of the things that our prospective and current customers tell us is they like the flexibility we provide. On request we will modify any of our products to suit their needs and visions. Plans for the future are to expand our online presence. We have developed retail websites for all our products and want to increase our marketing to the public. We are also looking for former fire or EMS personnel to sell the Emergency Medical Info Kits on a commission basis to get these across the country.